Okay, so… I had full intentions of doing “Why Garden Wednesday’s” all through the month of February to inspire you to start a backyard/balcony/windowsill garden this spring. But, Wednesday came and went without a blog. I had been on the road for work, we had a major snow storm (again…), and I just wanted to spend sometime with this cute kid. Spring is coming, even though it sure doesn’t seem like it in the Midwest, and every weekend in February I will be posting reasons on why YOU should start a garden. So, without further adieu, Numero Uno, a reason top of mind for everyone: Money. 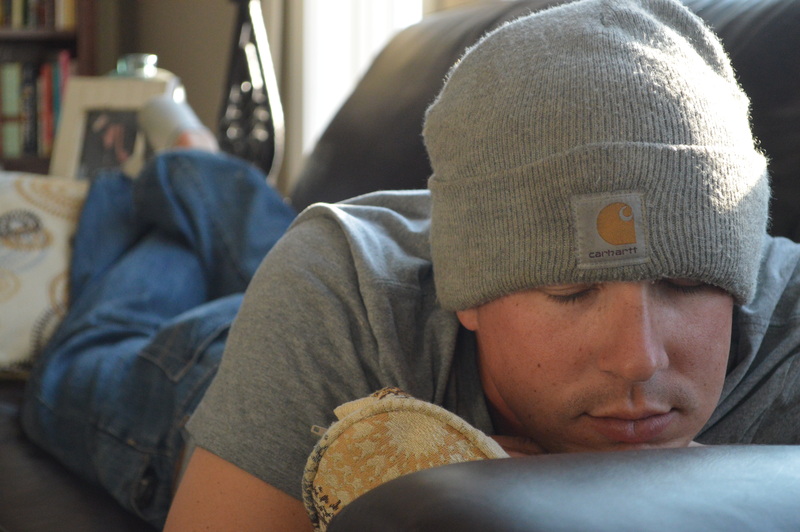 Last fall, I wrote as I reflected on the summer’s garden that gardening has definitely saved Adam and me a little cash. Thanks to the garden, I do not buy as a much at the grocery store and we are far less likely to go out to eat than we had been in the past. This is because we had so much food of our own to eat! I have been seeking out garden workshops around Indiana to try to gain more knowledge and skill. 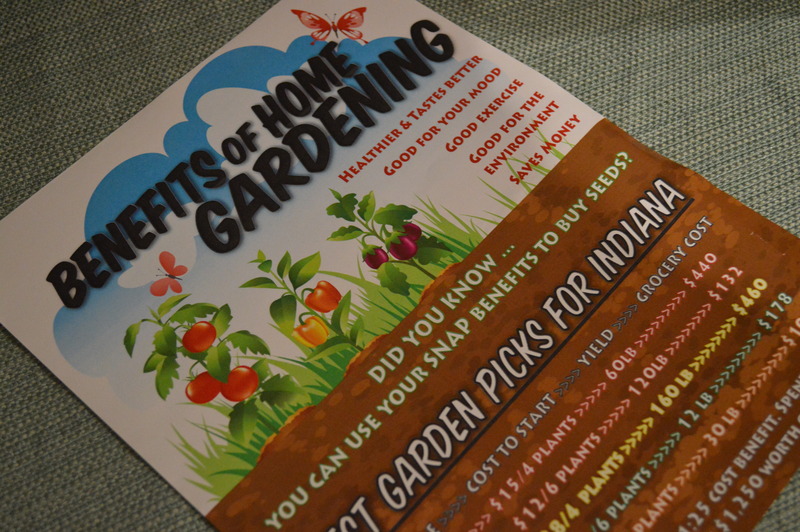 At a program last September, put on by Purdue Extension, I picked up a flyer illustrating the benefits of gardening and the numbers listed for dollars saved. It’s impressive! Home gardening gives you a 1:25 cost benefit. This means, if you were to spend $50 on seeds you could produce over $1,200 of food. Here’s a break down of a few items from our garden explaining what we pay and what we could be paying if we were to purchase them at a store. The chicks were $1 each and its $11 for feed every month. 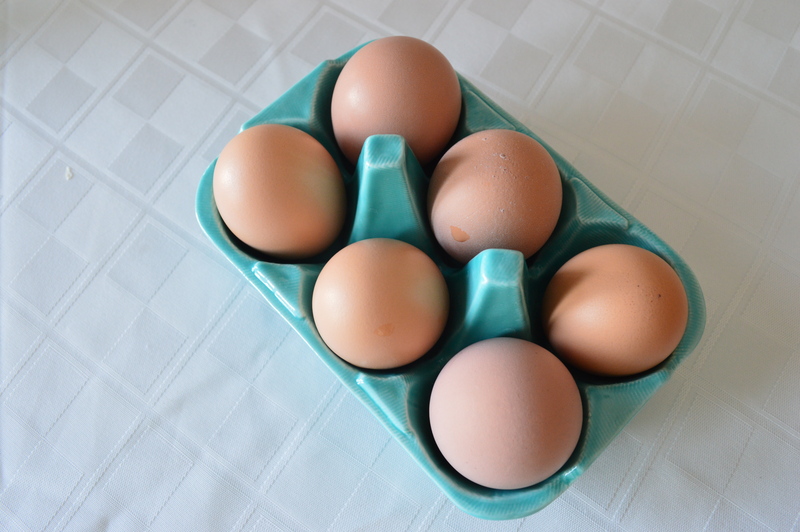 We get around 11 dozen eggs a month from our five hens. So, our eggs are about a $1.00 a dozen. 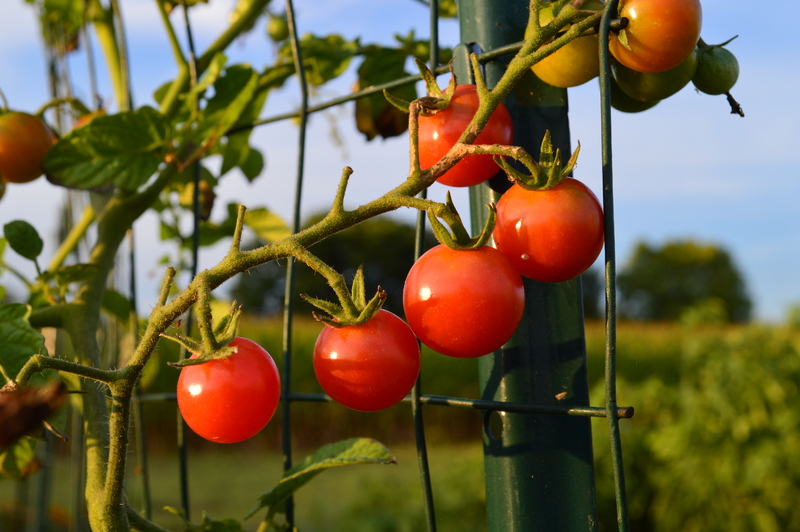 One tomato plant can give you around fifteen pounds of tomatoes. You could buy a tomato plant for about $2.50. We started our tomatoes from seeds and were able to get twenty plants of various varieties about six bucks. So, a pound of our backyard tomatoes were a whopping two cents. I thought this was a funny picture from last summer. Zucc’s the size of wine bottles! A packet of zucchini seeds is about $2.00. You could get about 10-15 zucchini plants per packet. Zucchini plants are like weeds. They just keep coming! 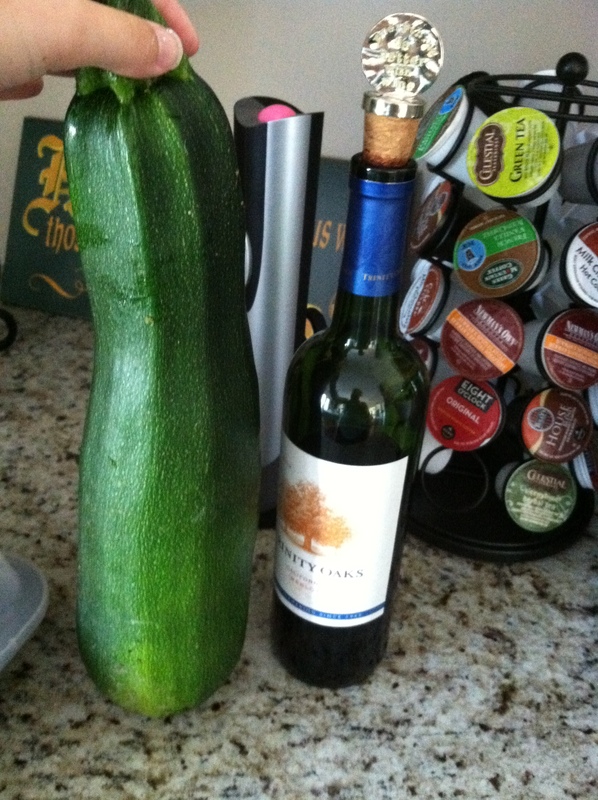 We would get one zucchini from each plant about every day last summer. A typical plant will give you around nine pounds of zucchini each season. We had six zucchini plants last summer making a pound of our zucchini about four cents. A packet of cucumber seeds is about $1 and could give you thirty plants. 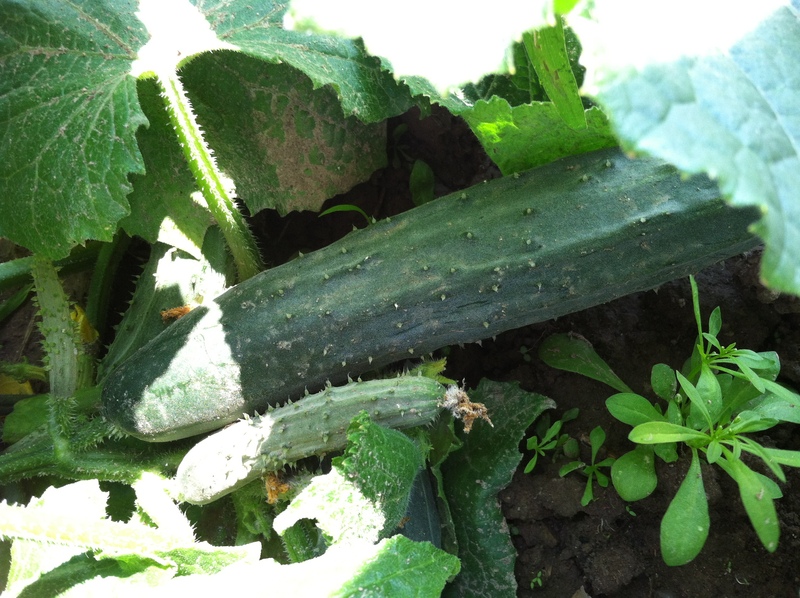 We planted four cucumber plants and got about three pounds of cucumbers per week per plant when we were harvesting, making well over thirty pounds of cucumber for the season. Our cucumbers were less than three cents a pound. You have to sow carrot seeds directly into the ground. 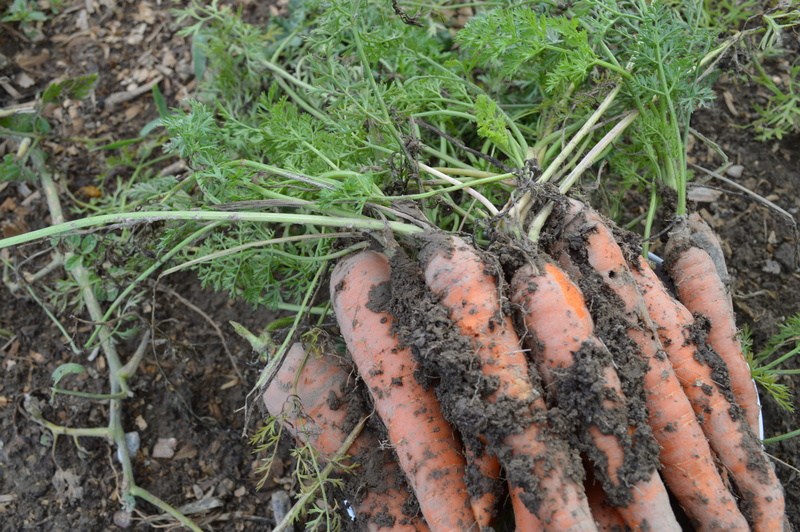 A packet of seeds is about $2.00 and you could yield at least thirty pounds of carrots from one packet. We plan to plant many more carrot seeds next year. The taste of a backyard carrot versus a carrot from a bag of baby carrots in the store is amazingly different. It has so much more depth of flavor and at six cents a pound, why not? When I start to add in our entire garden’s lettuce, broccoli plans, snap peas, strawberries, herbs, peppers, and more the savings really start to add up. Money savings is one of the big reasons I enjoy sharing our garden stories. There are so many people in America struggling to feed their families, let alone feed their families well. Gardens help make this possible. The knowledge just needs to be shared. There are many groups around the nation such as Farm to School and Extension offices working to inform people the benefits of gardening and teach the skills needed. Community and Urban Gardens are popping up in cities everywhere. And, SNAP, or Supplemental Nutrition Assistance Plan, participants can purchase seeds or plants from any SNAP retailer or Farmers Market. This is awesome because the participants can use the seeds to grow food that they normally couldn’t purchase… in large quantities, too! Still not convinced a backyard garden is worth it? Tune is next weekend and we will talk about your health.